Growing habit on the the mountains of Humahuaca in the province of Jujuy, Argentina 3400 metres above sea level. Altitude: 2900-4300 metres above sea level. Habitat: It grows in very arid mountainous area where its thick hair protects it against light night frosts and from the intense sunlight found at the altitude in which it resides. Oreocereus trollii f. cristata hort. 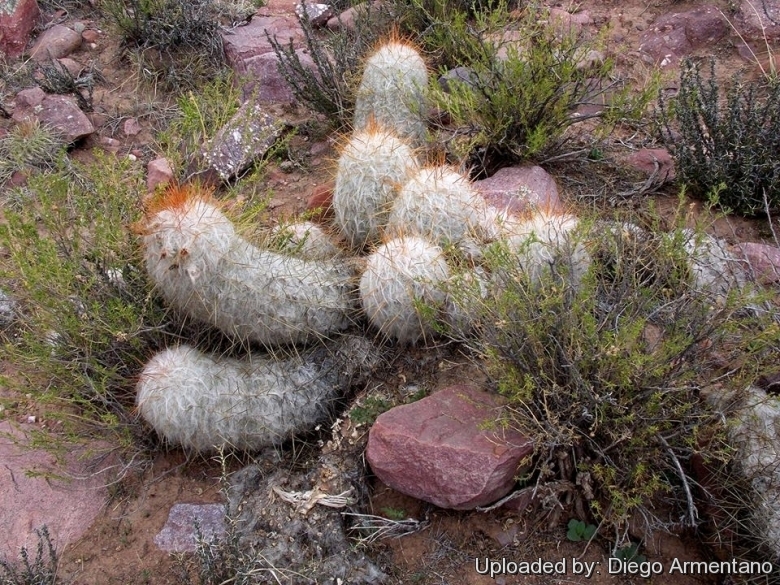 Description: Oreocereus trollii a.k.a. 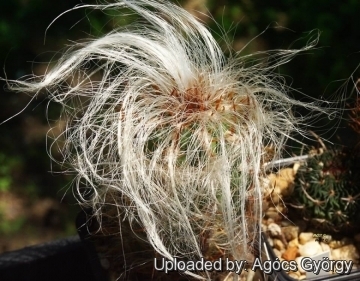 the Old Man of the Andes is a s shrubby columnar cactus with fine, completely enveloping hair and powerful coloured spination, but much dwarfer in stature than Oreocereus celsianus. 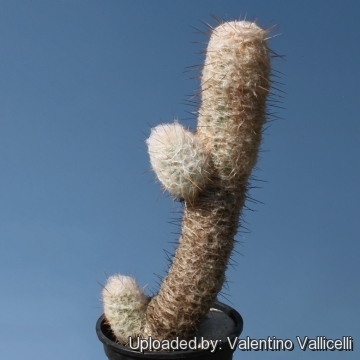 Young plants of Oreocereus trollii are also very popular in small cacti collections. Habit: It branches at the base and forms clumps of short chunky columnar shoots that can lay sideways with time. 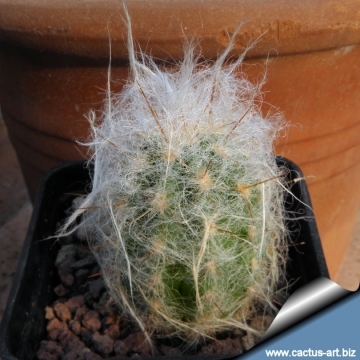 In young plants the shoots are like thick spheres and difficult to recognise as belonging to an Oreocereus. 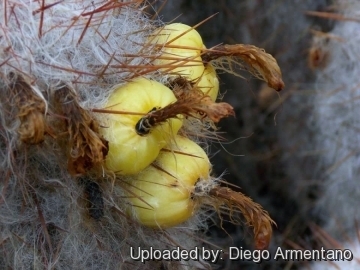 Stems: 6-10 cm in diameter, at first almost globular, then up to1 m tall (usually less than 50 cm), light-green with a dense, cocoon-like covering of wool (actually radial spines that have evolved to resemble "hairs"), which entirely covers the stem and from which spines emerge. Ribs: 15-25, low, strongly tuberculate. 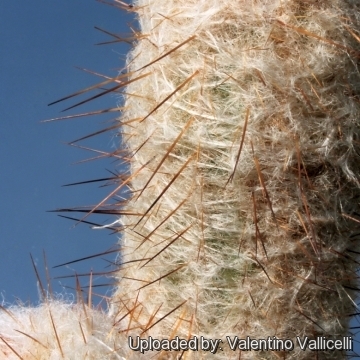 Radial spines: Oreocereus trollii has 10 to 15 very fine creamy-white or greyish modified spines up to 7 cm long that look like hair or wool. Central spines: 3-5, stout awllike-like up to 5 cm yellow, orange, orange-red or brown, dark tipped, protruding through the fine, woolly, hair-like radial spines.. Flowers: Up to 4 cm long pink to violet red and semi-tubular in shape. 8) Sir Oliver Leese “Cacti” Triune Books, 1973. 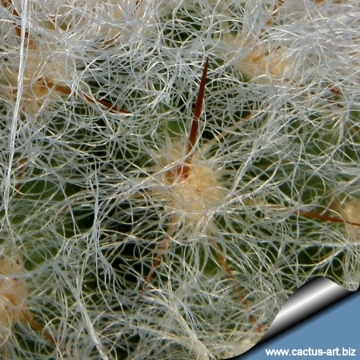 Cultivation and Propagation: Oreocereus trollii is a a much decorative frost hardy cactus easily found in cultivation. Hardiness: The plant is tolerant of temperatures down to 10° C (or less) if kept dry and in a dormant state during the winter. In wet winter areas it is recommended to keep the plant in a sunny greenhouse enclosure to keep dry and protected from wet conditions. However in cultivation it is better not to expose it to temperatures lower than -5° C, even if in an aerated and protected location In presence of high atmospheric humidity avoid any frost as it is particularly sensitive to root rot. Outdoors this plant is very adaptable, as long as you avoid excessive humidity in the winter months. Exposure: It need full sun exposures with ample airflow for best appearance, but, as a former mountain dweller, does not care for extremely high temperatures in summer.